My name's Gordon and I come from the E9 and E36 worlds but I am fascinated at what BMW did with the S14 engine program to compete and win in the late 80s/early 90s. I have read for the past two weeks for information regarding the Group A and DTM engines but trying to find really detailed information is like trying to find a needle in a haystack! I have gone through countless posts on here, google, the Group A manual and parts catalogue and even realoem. They've answered most of my questions, just not the really detailed ones. I hope the members of this forum can help me fill in the blanks! 1) In the parts catalogue it shows the 2.3L Rally and Group A engine as the S14/1, however they have different part number cylinder heads. What was different about them? 2) Are the domes of the 2.3L and 2.5L pistons exactly the same but just with a different bore? Any difference in deeper valve reliefs or shapes? 3) Are there any pressure charts out there for the SRD5, SRD7 and SRD9 springs? 4) What was different about the Group A con rod bearings versus stock con rod bearings? 5) I read that the Group A headgasket is precompressed and reinforced. How is it reinforced? Is the gasket of OEM style material or is it like an MLS type? 6) I am having trouble finding out the compression ratios, redlines and camshaft setups for S14/1 through S14/6 engines. Can anyone help me out? All I know is the S14/1 has a 12:1 ratio and a 8500rpm redline and that the S14/4 used a 316/292 cam setup and also a 8500rpm redline I believe. 7) In the manual the S14/1's minimum fuel octane rating is 98RON, were there ever announced minimums for the other engines? 8) In all of the build threads I've read people say the BMW MS spec for quench is 0.8mm, I cannot find that in the Group A manual. Can someone tell me where to find that spec? On a side note, I see many people running Arrow, Carrillo and Pauter rods, but I haven't seen anyone running Muzzi Motorsport's 450g rod. Is it a price thing or is that rod made to last only 2 race weekends? Hi, I would've thought someone with this info would have posted by now? I'm sorry I can't really answer those questions they are really good ones haha, I would also like to know. I do know that redline of 8500rpm is a bit low from what was actually used in racing. The head gasket is not an MLS gasket. If you don't have much luck here then try s14power.net John might answer some for you. Yeah I read through the questions hoping I could answer at least one of them....but I can't....I got nothing. I could research them one at a time...but I have no ready answers. 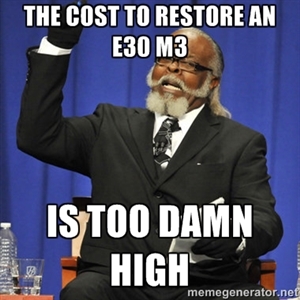 The main reason I think is because very few owners build engines to specific BMW Motorsport specs. The parts are just too expensive for most owners, and detailed specs too elusive.. Sorry I cannot help....but that is the simple truth. Mario Langsten (mario@vsr1.com), Don Fields (don@mrmcar.com), Ron Checca (ron@checca.us) and John Smith (john@s14power.com) are probably your best resources for these questions. Last edited by Brandon; 12-06-2016, 02:08 AM. Or JimmyP as well. There are a few more out there but they tend to be busy with work. Thanks for all the heads up! I will continue to try and gather more information. I could've responded with. Could you do us a favor and update us as to the answers that you find? I think most of us would like to learn more about the performance standards that you seek to attain. It might also inspire the other members that can assist you to participate in the forums again. Definitely some mastermind quiz questions there, I think if I was lucky enough to own a group A car then I would possibly know some of the things that you asked. The head gasket is a conventional gem looking gasket. the engine here is built to correct spec by a man who worked on these things back then.. If it's precompressed at 1.4mm, does it compress any more after the head's torqued? BMW E30 M DTM 2.5 L Dry Sump race engine with carbon fiber slider intake manifold. I've got factory works race engine parts for BMW customers looking to restore your factory race car as well as offering BMW Classic restoration offerings and BMW works Schnitzer also rebuilds original factory BMW AG Classic Motorsport race cars. 1) The 2.3L Rally and GrpA S14/1 were first homologated in Mar/01/87 with 26mm intake ports. There was then an update on May/01/87 for "normal evolution of the type" with 28.5mm intake ports, however, it specifically says "not valid for rally", hence the two cylinder head part numbers. 3) The SRD7 springs, measured by a reputable enthusiast, have a seat pressure of 76lbs and an open pressure of 257lbs. That's all the update I have for now. Excellent thread. One thing I have always wondered and never really found out is where the intake port measurements are taken? Is it top to bottom? I have an update for my previous post. What I wrote was taken directly from the homologation papers, however it didn't end there. The parts catalogue lists both the 032 and 033 cylinder heads as 29.5mm, but realoem lists the 032 as 27mm. That got me wondering why the numbers didn't match up. Well, in the papers the measurements had a tolerance of -2% to +4%. 26mm plus 4% is 27.04mm and 28.5mm plus 4% is 29.64mm. So I can safely say for sure now, that the 2.3L rally head had 27mm intake ports, and the GrpA head had 29.5mm ports. Case closed. Ah you're lucky, I just found this out last night. The 27mm intake ports were taken 25mm into the port, top to bottom. The 29.5mm intake ports were taken 37mm into the port, top to bottom.